Stephanie Ondo sells her cotton, wool, hemp, and linen yarns at www.sloyarnandfiber.com. When Tropical Storm Irma blew through last fall, tree limbs peppered lawns throughout the Lowcountry. While most of us classified the branches as debris to be tossed, Charleston resident Stephanie Ondo saw them as something else: a gold mine for common greenshield lichen. “It gives off soft greens that are different every time,” says Ondo, who uses lichen, along with other natural ingredients like walnuts, indigo, and turmeric, to dye organic yarns, which she sells via SLO Yarn and Fiber, launched in 2015. Ondo had been knitting for eight years when she took a good long look at her craft closet. “My yarn stash had gotten too big. I stood back and thought, ‘Well, it looks like I’m really passionate about yarn—why not go all the way with this?’” Since then, she’s learned the complex art of yarn making, from start (skirting and scouring) to finish (carding or brushing, then spinning). And she’s become an expert at dyeing yarns; it’s now the part of the process she focuses on most, sometimes working with materials that are already carded or spun. Ondo’s end goal is to open a brick-and-mortar Mecca for crafters of the Lowcountry. Until then, her hand-colored yarns—which are packaged as 100-gram skeins and range in material (organic cotton, wool, and hemp) as well as weight (fingerling, worsted, and bulky)—can be found at sloyarnandfiber.com or, come spring, at the Charleston and North Charleston farmers markets. 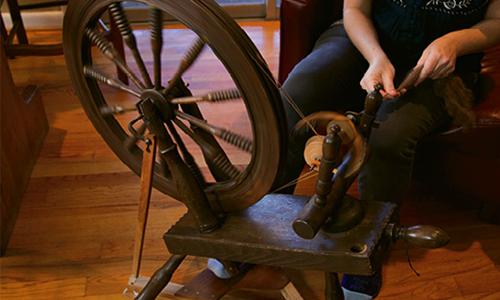 Ondo spins yarn on a refurbished 200-year-old spinner. 3. Spins the wool into a continuous thread on her spinning wheel; she buys yarn that’s already spun as well.